Wii Sports (Wii) ESRB rating: E Wii Sports is the first game bundle Nintendo has shipped with a console system since the Super Nintendo and Super Mario World. 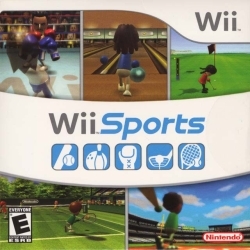 They have also always been great games and Wii Sports is no exception. Wii Sports consists of five games: Baseball, Bowling, Boxing, Golf and Tennis. Each game has multiplayer support with a couple of them allowing up to four players. The Wii Remote, or ‘Wiimote”, is used in a unique way for each game and it has a surprisingly natural feel to it. Before you start competing I highly recommend learning the moves and techniques by doing the training exercises. Each sport has four training exercises to complete and if you do well you’ll be awarded a medal. You’ll get to do batting practice, tennis target practice, punching bags, putting, and several more. After you unlock the training modules they will be available for your Wii fitness routine. The Fitness mode keeps me coming back to play Wii sports daily. Every day you can do 3 randomly chosen exercises and depending on how well you do you’ll be given your Wii fitness age. You can get anywhere from 20-80 years old, with 20 being the best possible. This game allows up to two players. The players either are hitting or pitching as the computer does all the catching and running for you. If you have any Mii’s in your Mii plaza they will appear in the game with you. When it comes to hitting, you hold the Wiimote like a bat and swing when the ball comes close. It’s pretty accurate. As for pitching you move your arm and act like you’re going to throw the Wiimote but obviously you don’t for your television’s sake. Make sure you have the controller strapped to your wrist! You can throw different kind of pitches by pressing various buttons and you can do inside or outside balls by using the arrow pad. The bowling game is one of my favorites and is sure to lure many women and grandparents into trying out the Wii. To bowl you hold the Wiimote to your face and swing your arm back and then forward to release just like you’re really bowling. The only difference is that you don\'t let go of the Wiimote You can adjust your starting position and angles to get those tough splits. Boxing is the only game to require both a Wiimote and the nun chuck to allow for punch/block detection. To throw a punch you simply grab onto the controllers and swing away. It can do upper, lower, side blows and upper cuts. You can block your face or waist by covering yourself with the controllers in a defensive stance. This game is the most strenuous and is great for a workout, however it is the least accurate and not as fun because of that. The audience in this game will have your Mii Parade Miis in it. I’ve never really been that much into golf so I don’t play this game that much. I will admit that it’s not bad though. You can choose your golf club, the angle and practice hit to determine how much strength you think is right. To swing you hold the Wiimote like a golf club and swing just like swinging a real golf club. Hopefully the ball lands in the green, because you get penalized if it lands in the brush. This game is very well done and is another one of my favorites. You can have up to four players and in single player mode you can play with an AI partner or play both characters in doubles. Managing two players isn’t too bad. The AI handles all running, so all you have to do is swing the tennis racket. When it comes to swinging you can either do a standard swing or a backhand. The accuracy is pretty good and depending on how you swing you can spike the ball at your opponent or add some spin. When you play against the computer you can gain or lose skill points depending on how well you play. After you reach one thousand points in a category, you become a pro and are awarded a bonus. For example, in bowling you are given a sparkly ball instead of a standard marble one. You can lose and regain your pro status depending on how well or poorly you play. When playing against a live opponent your status isn’t affected. The Wii definitely has the weakest graphics of the three newest consoles out today. This game certainly demonstrates that fact. Though the game has a neat graphical style to it, it’s a shame that they didn’t feel the need to do any kind of anti-aliasing to help limit the jagged edges effect. This is really evident on a large screen with progressive scan (480p). The players (Miis) are simple yet unique and often don’t have full limbs. It’s funny to watch the Miis bowl without arms or run bases without legs. It does manage to draw you in to see the Miis representing you and your friends and family doing well (or not so well). The graphics are simple 3D and they do the job; they are not intended to knock your socks off. From the catchy theme music to the sound effects and the announcer voices, the sound is good in this game. The audience cheers and boos with your playing. When doing the boxing training, the trainer’s voice is a bit muffled but the main announcer is good. Sports in general are pretty clean and this game is no exception. The boxing is blood, cut, and bruise free. When you do damage it takes a slice away from their health meter. This game is fun and appropriate for all ages. If you get a Wii and don’t feel like spending $50 a pop for the newest titles out there, have no fear this bundled game will keep you occupied and pleased with your new console system. Although it’s not a graphics powerhouse, it is undoubtedly fun and will bring you hours of enjoyment and help you appreciate the innovation of Nintendo’s new Wii console.